A Fast Radio Burst From Close to Home? There has been a flurry of papers lately in the astronomical literature on the nature of Fast Radio Bursts (FRBs)– mysterious bursts of radio radiation that last a few microseconds, don’t repeat, and have no counterparts in other wavelengths. This is likely because after years of speculation more and more astronomers think FRB signals are likely real astronomical sources (as opposed to an instrumentation issue or weather phenomenon), with high dispersions that imply they could be from very far away, so astronomers have been exploring various possibilities for their origins. Only six FRBs have been confirmed so far in the literature, all discovered at Parkes Observatory, and this paper focuses in particular on one of the FRBs, called FRB010621. This burst is particularly interesting because while most bursts have come from high inclinations outside the galactic plane, FRB010621’s position was just four degrees from the galactic plane. Further, this position is coincidentally from a region where the distribution of material within our galaxy has been studied before, which means it is possible to calculate how much the dust contributed to the FRB’s dispersion measure, which is a relationship between time and frequency that tells you how far a signal came from. This in turn could tell us if the FRB originated from within the galaxy or further away, which is crucial in narrowing down what mechanisms would create these signals. 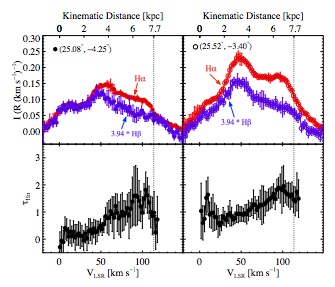 Figure 1: Top: The hydrogen alpha (red) and hydrogen beta (blue) spectra of the diffuse ionized gas emissions from the direction of the FRB. Bottom: the estimated optical depth at hydrogen alpha. Note there are two different graphs; these correspond to two measurements taken nearest the FRB’s observed direction. The authors used data from the Wisconsin H-Alpha Mapper (WHAM), an all-sky survey dedicated to mapping ionized gas within our galaxy. In Figure 1, you can see the WHAM survey’s mapping of the density of ionized hydrogen in the general direction of the FRB. From this, the authors could then calculate the distance to the pulse using a filling factor- the fraction of the line of sight occupied by dust clouds- the path length of the hydrogen-emitting gas, and the dust distribution. After analyzing the statistics of the data, the team concluded that the distance to the pulse was 7-40 kiloparsec from Earth. They concluded the pulse likely originated from within the Milky Way Galaxy (whose distance to the “edge” is 24 kiloparsecs from us)- in fact, the team derived a 90% probability that the FRB originated from within our galaxy. The reason this is an interesting result to astronomers is if an FRB can originate from within our galaxy it vastly narrows down what could be creating them, and the team considers two possibilities. The first is that this could be a new sort of pulsed emission from a rotating neutron star (a pulsar). No pulsars have been discovered along the line of sight of FRB010621, but this is unsurprising as the pulse came from a direction with a low density of pulsars- they are typically found in the mid-plane of the galaxy, but then the ones that create FRBs could be distributed differently. The second option is that the FRB originated from a black hole in the galaxy undergoing some unusual process, but unfortunately the team could not conclusively differentiate between these two scenarios. 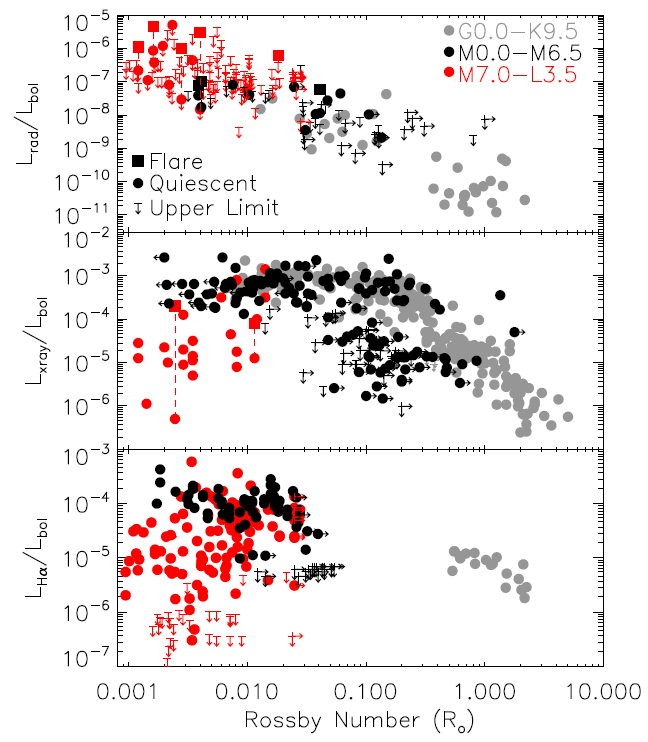 Finally, the authors note that while they believe FRB010621 likely originated from within our galaxy, there is a good chance that the other FRBs are extragalactic. This is because the remaining five were all discovered to have locations from well outside the galactic plane, and the electron column density when looking outside of the galaxy at these latitudes is not large enough to explain the high dispersion measures seen in FRBs. The team speculates that it could be FRB010621 belongs to a different class of FRBs than the other five, but no one knows for sure. At this stage more observations of FRBs are needed to get additional statistics on them… so we can write many more astrobites on papers working out FRB origins in the future!